Richard Willoughby Gott, an Oxford educated ex-public schoolboy might seem an unlikely propagandist for a latin American revolutionary leader. According to Wikipedia, Gott is "a former Latin America correspondent and features editor for the British newspaper The Guardian, he is currently an honorary research fellow at the Institute for the Study of the Americas at the University of London. He studied history at Oxford University and worked at the Royal Institute of International Affairs. In the 1960s he worked at the University of Chile, where he wrote Guerrilla Movements in Latin America, "the enduring bible" on that topic." In January 1966, Gott was a candidate in the byelection in Kingston upon Hull North byelection for the 'Radical Alliance', running on a platform which stressed opposition to the Vietnam War. In 1967 he was in Bolivia as a freelance journalist for the Guardian to witness the events surrounding the capture and murder of Ernesto Che Guevara, playing a role himself by being able to confirm to the world that the 4-5 hour-old body in question was actually Che's, having met him in Havana in 1963. 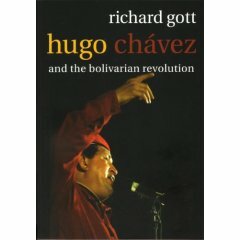 In the last few years Gott has focussed his extensive writing on the Cuban and more latterly the Venezuelan revolution. The Chávez government, for its part, has forged ahead with various spectacular social projects, assisted by the huge jump in oil prices, from $10 to $50 a barrel over the past six years. Instead of gushing into the coffers of the already wealthy, the oil pipelines have been picked up and directed into the shanty towns, funding health, education and cheap food. Chávez himself, a youthful former army colonel of 51, is now perceived in Latin America as the most unusual and original political figure to have emerged since Fidel Castro broke on to the scene nearly 50 years ago. With huge charm and charisma, he has an infinite capacity to relate to the poor and marginal population of the continent. A largely self-educated intellectual, the ideology of his Bolivarian revolution is based on the writings and actions of a handful of exemplary figures from the 19th century, most notably Simón Bolívar, the man who liberated most of South America from Spanish rule. Chávez offers a cultural as well as a political alternative to the prevailing US-inspired model that dominates Latin America. In Gott’s sympathetic account, Chavez is a magnetic personality of the Clintonian type, “a genuinely original figure in Latin America,” a radical left-wing nationalist, to be sure, but a pragmatic improviser, and certainly no dogmatic socialist. Chavez’s program for Venezuela remains somewhat vague, even to the man himself, but his concern for the country’s poor and marginalized is, in Gott's view, sincere and his vocation is essentially democratic. The belief that a pure revolution can only be born once all remnants of the previous society has been destroyed is a popular theory among followers of Pol Pot's illfated Cambodia and of Mao's Cultural Revolution. And, according to Chavez-watcher Richard Gott, several of the president's closest advisers were once associated with a Chinese-oriented split from the Venezuelan Communist Party, and Chavez himself has declared that "I have always been a maoist". Certainly Gott is in a good position to know the true nature of his hero. At January's World Social Forum in Caracas, he got up close and personal. It felt like another world, but not long after we were in a stadium full of excited Chavistas and forum delegates who had gathered to hear 'El Comandante' speak. Thousands of people danced and sang in a festival atmosphere that was unlike any political rally we'd ever attended. Finally, surrounded by familiar faces like Walden Bello, Cindy Sheehan, Samir Amin and Richard Gott, Chavez spoke at length with numerous historical diversions and even singing. However, he spoke of something that we've been gathering a sense of both before and during the forum: that Latin America is not on the defensive against neoliberalism but rather is on the offensive in promoting and creating alternatives. There is however another, near forgotten side to Richard Gott. In the first act of what portends to be a major political scandal, London’s Fleet Street has been rocked by the revelation that a leading British journalist was recruited by the Soviet KGB to spy on his colleagues and politicians. Richard Gott, longtime foreign reporter and features editor of The Guardian, resigned in the wake of the disclosure by The Spectator. Gott, 56, denied any wrongdoing but admitted that he took 600 pounds (about $935) for “travel expenses” so he could meet Soviet officials outside of England. But according to KGB sources cited by The Spectator, Gott’s activities went far beyond the bounds of an “enjoyable joke.” In an editorial accompanying Gott’s unveiling, The Spectator stated, “Mr. Gott’s commitment to supporting ‘liberation’ movements in the Third World, his attacks on Britain’s institutions and defense of communist governments, read very differently once his true allegiance is known.” The Spectator article was written by Alasdair Palmer, who collaborated with defected KGB officer Oleg Gorievsky on a forthcoming book on Soviet intelligence activities in Britain. I wonder who pays Richard Gott's bills these days? I always wonder who promotes the works of these people like Chavez. I think you would have to look at the various front groups that endorse his work first and work it up from there. Hmm, just who is paying Gott and other firm dedicated Chavez supporters?